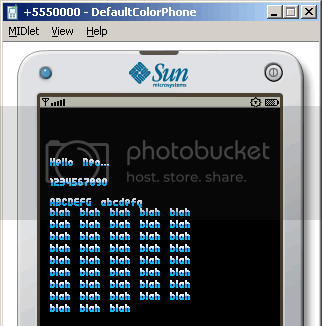 On the previous part of this tutorial, we created a clsFont class for drawing bitmap fonts. Now we will use the class to see if it actualy works. So if you haven't read the first part of this tutorial just click on this link: Using Custom Fonts or Bitmap Fonts Part I. I have also added more methods to the clsFont class that you may find useful so stick around a bit. //is it time to toggle key state? Those additional methods could be used in drawing scores and numbers that are aligned to the right. Very useful if you want the score to grow leftwards like in score boards. The drawStringWrap() method makes use of the drawString() method to draw each word. The method considers the space and non-printable characters as a word delimiter. You can change the line spacing by changing the value of lineS. There is a lot that could be done to make the clsFont class more functional. For instance, you can add justification or optimize the already existing methods. You can also add another set of characters to the bitmap with a different style and modify the code so you can select which style to use. Since all the building blocks are in place, I think I'll just leave the missing parts to you. You could do better? Found an error? Is it as confusing to you as it is to me? Don't hesitate to leave a comment. Excellent post! Thanks a lot, it is a time saver for me to figure this out myself. I've been struggling with this for quite a while, or actually on whether or not to go this route. My next step now is to start working on entry-fields etc along the same line. Displaying text is one, entering is even more important. I'm glad you liked it. Hhhmmm, you just gave me a great idea for a tutorial. Thanx! Wonderful! From now on I will be you loyal student, I am glad u here to grow me. Keep this up I will tell u of my project when it’s done. I would love to be like u one day help rising programmers do their best. You are an inspiration. Thanks for that beautiful font to. why? are you putting the >.< thing in here now. I don't understand. the difference between the chars is 8 pixels and not 9. Therefore, you have to change the "int cx = cIndex * 9;" line to "int cx = cIndex * 8;". Another question: do you have some application that can create this kind of PNG files with fonts automatically (from some regular windows fonts)? I have no idea. But after looking up the methods of the Image object from the javadocs, it may be possible to create a new modified instance of the image by using a combination of getRGB() and createRGBImage(). 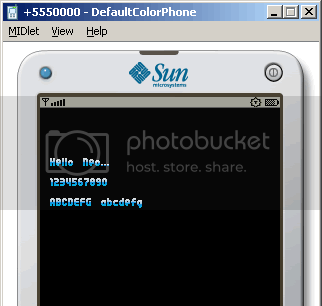 This means you would have to create a new image from the modified ARGB pixel data of the original image. What I actually do to display the text with different colors is I add a new row to the existing bitmap font image. I just copy over the first row and modify the colors and styles. The drawing functions I use are similar to what I have posted here but have one extra parameter which let's me choose which row of the bitmap font will be used to draw the characters/strings. I have double checked the image and the code, and there seems to be nothing wrong with it...I also re-used the code for the tutorial Handling Text Input or Accepting Character/Player Names. Seems to work fine. The characters in the bitmap font used is placed in a 9x10 pixel grid. So I'm pretty sure that each cell is 9 pixels wide. The position of the characters are computed by multiplying the character index by the width of a cell much like you would do when working with tiles in a tile based map. However, the widest character in the bitmap font image I used in this tutorial is actually 8 pixels so there is an extra 1 pixel of space to the right of each cell. You can still make the bitmap font image smaller by making the cells 8x10 pixels without cropping any of characters in the bitmap font. No, I drew the bitmap fonts by hand...well not really by hand since I used pixel fonts. I usually just use Fireworks (and an ASCII table chart). I've been planning to make one but I'm pretty sure that there are already some good ones floating on the internet. first of all, really great tutorial, I only wish I had found this sooner, could have saved me a lot of time. I had the same problem as Micheal, and changing to "int cx = cIndex * 8;" fixed it. Thanks for the article. It was of great help. I have a problem with the word-wrap method however. The method doesnt consider the character spacing. But what if my font language in Unicode format( Khmer-Unicode ) that have​ head and foot like this ព្រះរាជាណាចក្រកម្ពុជា និង ថៃ what should i do. Can we display text in stringItem or textField object instead of canvas? The tutorial is very easy to understand, it makes me very clear to understand. One problem, I m not finding fonts.png file. Plz help me. Better to mail (misbahulalam@gmail.com) me. thanks so much, it is very helpful with me. Can you tell me where you get font image(filetype :png) ? I searched by google but i only found TTF font..